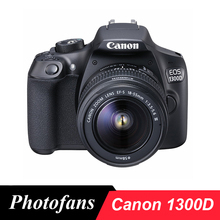 Comprising a versatile set of imaging capabilities along with support for a connected workflow, the Canon 1300D / Rebel T6 from Canon is a compact, sleek DSLR featuring an 18MP APS-C CMOS sensor and a DIGIC 4+ image processor. Combined, these two technologies avail rich image quality with reduced noise, along with a native sensitivity range of ISO 100-6400 that can be further expanded to ISO 12800 to suit working in low and difficult lighting conditions. The sensor and processor also enable the ability to shoot continuously at 3 fps for photographing moving subjects, as well as recording Full HD 1080p/30 video. Benefitting shooting with the optical viewfinder, a 9-point AF system incorporates a single center cross-type AF point for increased accuracy and focusing speed, and a contrast-detection focusing system offers refined autofocus precision for shooting movies or working in live view. The rear 3.0″ 920k-dot LCD offers a bright, clear image for playback and review, and built-in Wi-Fi with NFC also offers the ability to wirelessly share imagery from your camera to a linked mobile device for instant online sharing. The camera with the quality your photos deserve, the EOS 1300D/Rebel T6 can be ideal for smartphone or digital point-and-shoot camera users looking to step up their imaging game. It’s equipped with an 18.0 Megapixel CMOS image sensor and the DIGIC 4+ Image Processor for highly detailed, vibrant photos and videos even in low light. Whether you’re out on an adventure hike or snapping candids of your friends during a late night out, the EOS Rebel T6 can help you take photos you’ll want to show off. Built-in Wi-Fi and NFC connectivity make it easy to get your favorite pictures up on select social media sites for your friends, family and the world to see. If you’re new to DSLRs, Scene Intelligent Auto mode can conveniently and automatically adjust the camera’s settings to suit your subject. Easy to use and simple to share with, the EOS Rebel T6 delivers high image quality that’s sure to catch the audience’s eye. From uploading photos to select social networking sites, emailing family and friends or archiving images to a computer, the EOS Rebel T6 camera offers a number of easy solutions for sharing. It’s equipped with built-in Wi-Fi connectivity to help make wireless sharing of photos between compatible devices incredibly easy and convenient. Using Canon’s free Camera Connect app, the EOS Rebel T6 can connect to a number of compatible smart devices for image browsing and transfer, and also post images and videos to select social media sites. Built-in NFC (Near Field Communication) helps provide a virtually seamless connection to numerous compatible Android devices, and the Canon Connect Station CS100 device. To transfer your photos and videos, simply tap the EOS Rebel T6 camera to the Connect Station CS100 and the transfer is done! With the Connect Station CS100, you can store, view and organize all of your photos and videos from just one device.